We offer a wide range of manual and automatic degaussers for the secure destruction of data stored on both hard drives and Tape Media. Whatever your requirement, in terms of media type, volume or depth of erasure, we have the correct solution to ensure no data ‘escapes’ from your business. In many instances our degaussers, in addition to carrying NATO approval, have been approved to CESG standard (for restricted or less) for the secure erasure and destruction of information and data stored on magnetic media up to TOP SECRET level. The V92 Tapemaster LTO degausser is a powerful yet inexpensive high energy eraser. One of the most compact, high energy tape eraser / degaussers available, the V92 is capable of erasing all high energy magnetic tape media, oxide or metal based including broadcast, video, data & diskettes. A high energy, degausser especially designed to eliminate all data from computer, laptop and server hard drives. The V660 will also erase data from high coercivity tape, including LTO, DLT, Super DLT, AIT and more. The V94 was designed to be a cost-effective machine to erase a variety of common video and data magnetic media formats, it appeals to anyone in the video industry who requires a low cost, compact eraser to handle small to medium quantities of cassettes, cartridges or tapes. The DataGauss LG has a unique Data Destruction Auditor logging feature which produces an audit train for the erasure of hard Drives and Tapes. 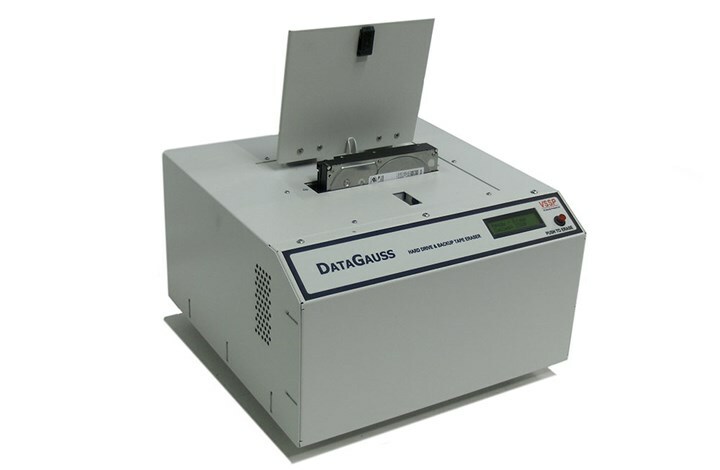 The DataGauss LG offers all the benefits of the best-selling DataGauss automatic, hard drive and back-up tape degausser but comes fitted the unique Data Destruction Auditor solution which enables the user to document and verify their hard drive sanitization/erasure and create data protection audit ready reports. Drives and Backup tapes. It uses pulse discharge technology and is fully processor controlled which enables the DATAGONE to offer a complete and secure erase on magnetic media. Media that can be degaussed includes Hard Drives that use both perpendicular and vertical recording techniques and most common backup tapes including DLT, LTO (including LTO 5), 8mm, DDS and more. The V880 is conveyor operated and is suitable to degauss Audio, DAT, VHS and S-VHS, VHS digital, 4&8mm, Beta SP/digital, video cassettes, Computer cartridges: DC, TK 50/70/85, DLT 3489/3490/3590, 4&8mm. This tape eraser has a limited duty cycle and optional belt cover. USA NSA & CESG APPROVED. A high energy, chamber-style pulse degausser designed to offer complete and secure erasure of magnetic media, to the highest security level, including perpendicular & longitude recording hard drives. Also capable of erasing data storage media including LTO, 8mm, DDS and more. Typical throughput is 40 hard drives per hour. Manual or remote control operation. If, like many governments and organisations around the world, you need a degausser that has NSA, CESG or NATO certification, then Security Approved range of government certified degaussers provides you with the maximum security required. In addition, if an organisation is involved in managing highly sensitive or confidential information such as financial, medical, education, personal and legal information, they must be vigilant in how they deal with the disposal of such information – and the use of an approved degausser would be highly recommended. A high energy, chamber-style pulse degausser designed to offer complete and secure erasure of magnetic media, to the highest security level, including perpendicular & longitude recording hard drives. Also capable of erasing data storage media including LTO, 8mm, DDS and more. Typical throughput is 40 hard drives per hour. Manual or remote control operation.